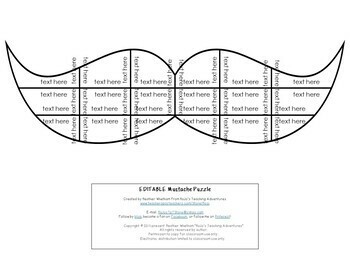 EDITABLE Mustache Activity - Make Your Own Puzzles on ANY Topic! 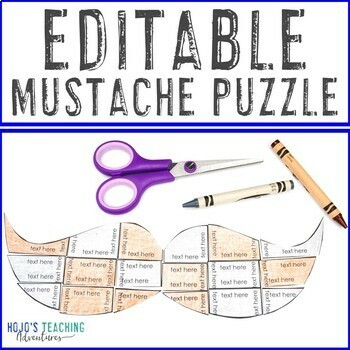 Let your students practice various skills with this fun EDITABLE Mustache Puzzle. These are a great way to engage students on various tasks. Use them to keep your students engaged due to the popularity of mustaches, on Mustache Day, for Father's Day, to celebrate Grandparents Day, and more. This puzzle will have students match up to 26 different problems together by correctly putting the 18 piece mustache together. You need to create the puzzle, so it will fit the needs of YOUR students! Great for your 1st, 2nd, 3rd, 4th, 5th, 6th, 7th, and 8th grade students. Check out the preview file. The preview is a PDF, but it will help you understand how the puzzle works and whether it's right for your students. HOW CAN THESE PUZZLES BE USED? You get one puzzle in this download. It is an editable puzzle with 18 pieces. You will make the 26 problems to fit the skill/s your students need to focus on. You can keep changing the problems to use this puzzle over and over again. 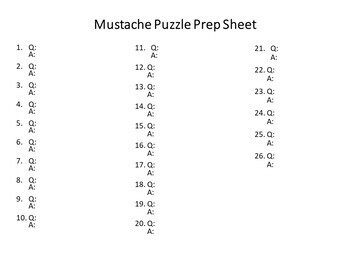 Use these puzzles anytime you need a fun activity - particularly for Mustache Day. Students with special needs also do well with these once they understand the concept. With this fun game format your students will stay engaged while practicing necessary skills! These puzzles are meant to be somewhat of a challenge - which is perfect to promote a growth mindset. Students will have to keep in mind the shape of the mustache and persevere if the task seems challenging. Tell students to rotate the pieces around and analyze what they can do differently until they fit. This is where their critical thinking and 21st Century skills will come into play! Just print and quickly cut on the lines and you have instant mustache centers that make skill practice fun and engaging. If you have some extra time, let your first, second, third, fourth, fifth, sixth, seventh, or eighth graders decorate the finished mustache. These colored masterpieces can then be used as artwork for the classroom, to help decorate a bulletin board, or be hung in the hallway to add some festive art flair. (And no administrator complaints since it's an academic activity!) Just imagine the Donuts for Dads bulletin board you can create! Homeschool Families: You're going to love these puzzles as a last minute resource! The next time you have a crazy hectic home school day - grab, download, type in your problems, and go! You'll get your sanity back, fit in some academic work, AND have fun at the same time. The answer key is made by YOU! Print two copies of your final puzzle - one for your student to cut up and put together and another one to keep in its full shape to use as an answer key. This way you can ensure all the numbers, words, or letters are in the correct order and that the shape is fully formed. **THIS RESOURCE CANNOT BE USED TO CREATE OTHER RESOURCES FOR SALE. IT IS NOT A COMMERCIAL LICENSE, BUT ONLY FOR ONE TEACHER IN THEIR CLASSROOM OR HOMESCHOOL. THANK YOU FOR RESPECTING MY COPYRIGHT. Love what you see? Click here now to follor my store! You'll get updates of new resources, sale alerts, FREE downloads, and more!